To confess, I developed a soft spot for the Russian 6C33C-B power triode after I first heard it perform in a Balanced Audio Technology (BAT) amplifier many years ago. Even under CES show conditions, while driving Avantgarde Acoustics loudspeakers, the BAT’s warm and spacious acoustic etched itself indelibly in my auditory memory bank. This tube has been championed by Russian-born designers such as BAT’s Victor Khomenko and Lamm Audio’s Vladimir Lamm, but it was totally unknown in the West prior to the defection in 1976 of Soviet pilot Viktor Belenko. Flying a MIG 25 “Foxbat” jet fighter at low altitude to avoid radar detection, Belenko managed to touch down in Japan. When Japanese and American intelligence agencies disassembled the plane, one of the surprises discovered was this 6C33C tube in the MIG 25’s communication power supply. The 6C33C was designed as a power supply series regulator tube, and as such is intended to be operated at fairly low plate voltage and high current; a typical operating point might be 200mA at a plate voltage of 150V. Its low plate resistance makes it possible to use a much lower turns-ratio output transformer, thus enabling greater bandwidth extension. It’s a massive tube featuring a super-thick glass envelope and consisting internally of two triode sections connected in parallel. It takes at least five minutes for it to stabilize its operating temperature. Thermal runaway is a possibility with this tube, and this should be addressed in the amplifier design. 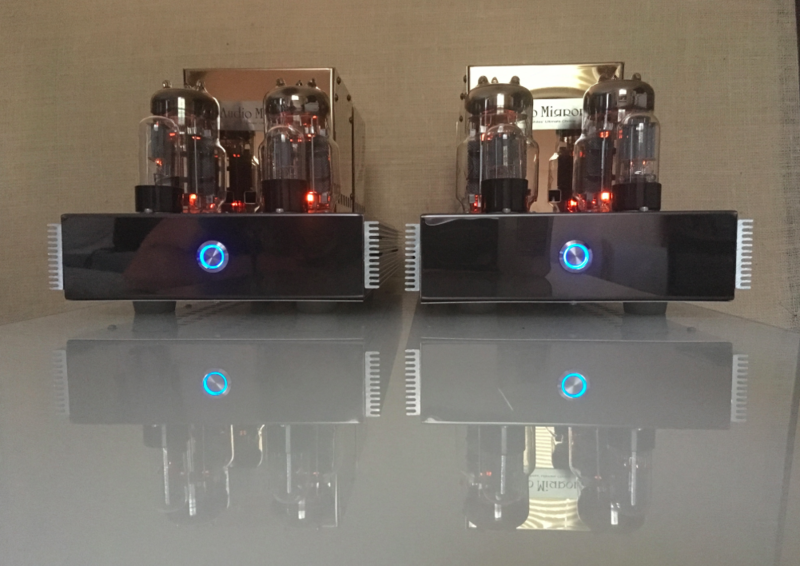 Audio Mirror’s Vladimir Bazelkov is no stranger to the 6C33C-B triode having started his electronics career in Bulgaria some 25 years ago. Based in the U.S. since October 2000, he has continued to refine his designs—to wit, the 45-watt amplifier under review sounds big and powerful and expands the reach of SET designs to even moderately sensitive 88-to-90dB loudspeakers. I’ve always been skeptical (and you should be as well) of manufacturer claims of 8-watt-amplifier compatibility with sub-90dB loudspeakers. Such a pairing may be played reasonably loud but lacks sufficient dynamic headroom to generate convincing scaling of dynamic peaks. No problems here for the Audio Mirror SET monoblock, though it really shines with higher sensitivity (94dB or greater) loudspeakers. Reproduction of dynamic peaks, in particular the ascent from loud to very loud, is most impressive, exceeding in this regard the performance of all other SET amplifiers I’ve auditioned to date. A key design factor is the use of a parallel pair of output tubes, thereby significantly extending power delivery, especially into difficult loads. Vladimir experimented with a variety of biasing schemes, including grid bias, resistive cathode bias, and a mixture of both cathode and grid bias. None of these approaches was able to generate the combination of musicality and dynamics he desired. He finally settled on a nifty MOSFET-based current sink for cathode bias, capable of sufficient headroom to accommodate powerful dynamic peaks. What I find most appealing and refreshing about all this is that Vladimir put his ears into the design process at each critical juncture rather than relying strictly on measurements or standard practice. The front end consists of two series-regulated push-pull (SRPP) stages. The first stage, a 6SL7 dual triode is used as a voltage gain stage and is direct-coupled to a 6SN7 drive stage. My review sample was outfitted with inexpensive Russian equivalents, 6H9C/6SL7 and 6H8C/6SN7. Vladimir encourages experimentation with regard to these tubes. He related that, in his experience, the Sylvania VT229 is a much better choice than the Russian stock 6H9C, and that the Chinese CV181 from Treasures HS is superior to the Russian stock 6H8C. Of course, I didn’t need much encouragement to start tube-rolling. I spent a fair amount of time experimenting with preamp tube substitutions and came to realize that the choice of a 6SL7 type makes for a significant impact on overall sound quality. The stock 6H9C gave rise to rather defocused image outlines, while an RCA 6SL7, known for its warm tonality, proved a bit too much of a good thing in this context. Ironically, I eventually settled on the Russian Melz 6H9C for its excellent spatial focus and clarity, and on the Sylvania chrome-top 6SN7. Very little global feedback is used. After many experiments with no-feedback amps, Vladimir has become a firm believer that some feedback is needed to firm up the bass.